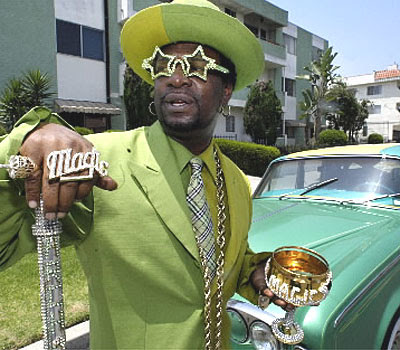 I admire Pimps…..or well I guess I admire the lifestyle. I am not for hitting girls or forced confinement or really anything that pimping stands for but I do like the fact that they can proudly wear “Gators” and drink from Blinged out cups……oh ya and I think they invented the “first taste free” style of marketing. First Taste Free in a nutshell is the same as try “before you buy” but since we are talking about drugs and Pimping I will respect their terminology and use First Taste Free. Not sure why but I started thinking about other places to apply this besides street corners but I did and I came up what I think is a good one. It may have been because I was in the Hospital over the holidays or just the fact I am a little obsessive about the concept of “marketing to people who can’t go anywhere” (Prisoners, Shut Ins and the like) but started to wonder why a Television manufacturer (like Sony, LG, Phillips, Sharp etc etc) doesn’t offer, as a donation, to replace all those ridiculous 12″ televisions in a patients room with flat screens in exchange for a big sign saying “These TV’s were donated by Sony”or whoever. The Goal is to expose people to these TV’s, with a First Taste Free, and hope that they will run out and buy one after they leave the Hospital since they probably got used to the set and since prices are dropping on them…..and lets not forget that even if sales from Hospital attendees doesn’t soar the TV MFG will get a tonne of great PR and can probably count on that exposure helping move some sets and creating good will with the Hospital going community. p.s. I fully understand this would be an expensive proposition but the risk would probably pay for itself quickly and the amount of people you would touch in the 10-15 years your product would be showcased would be unimaginable…….also it would be a great place to send all your refurbished sets! Something so simple, I agree would speak volumes to the masses.. ! With companies so large, what would that initial investment really cost them? Pennies in a bucket really. In internet marketing, I struggle to convey the simple facts – donate something, get some links, get some kudo’s. It’s not rocket science!